Three ways to experience the best of coastal Estonia. Seemingly endless rivers, lakes and coastline have carved as much of a place in Estonia's cultural heritage as in the landscape. Follow the current to serene beaches, waterfalls and recreation areas to enjoy Estonia's waterfronts. Sunset over the Kalev Yacht Club in Pirita, just a short way from central Tallinn. 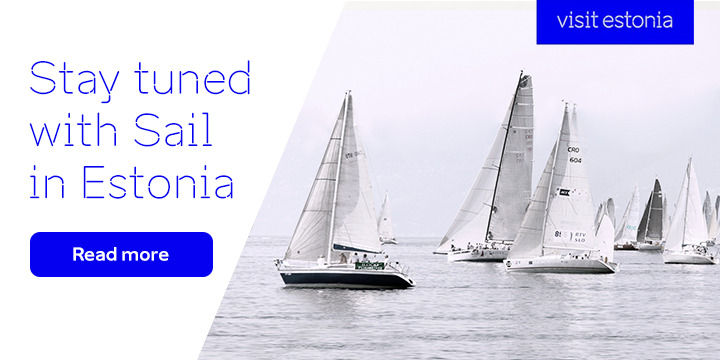 A boating enthusiasts could spend the whole summer sailing between the ports and islands on Estonia's 3,700 km coastline. Well-tended marinas with mooring spaces for guests and amenities like saunas, restaurants and accommodation serve as a jumping off point to explore the surroundings. Kalev Yacht Club, Noblessner Port, and Haven Kakumäe Marina are all located around Tallinn's waterfront, a stone's throw from the Old Town, Maritime Museum and more. Pärnu Yacht Club is West Estonia's largest marina which also hosts world-class regattas. Fish like flounder, perch and Baltic herring are best fresh from the seaside. Fish is a staple of the Estonian kitchen. Go to the source for the freshest flounder, perch and herring: the seaside and islands. You can find some of Estonia's finest restaurants in cottages on the beach, like Restaurant Valkla Rand, just east of Tallinn. A meal at Dirhami Fish Cafe is worth the journey to Northeast Estonia, where you can overlook the Dirhami marina. The ultimate seafarer should sail to the northern island of Prangli for an unforgettable meal at the island's sole eatery: Restaurant Prangli. Keila Waterfall, a short distance from the Baltic coast in Northwest Estonia. Rivers twist their tendrils towards the Baltic Sea, flowing over ledges to create stunning waterfalls. Valaste waterfall, Estonia's tallest, plunges 30 metres from the stratified Ontika limestone cliff along the northeast coast. Just before reaching the Gulf of Finland, east of Tallinn, the Jägala River fans into a 50-metre-wide waterfall. In winter, Jägala waterfall turns into an ice tunnel. To the west of Tallinn, the Keila river winds past the village of Keila Joa into a waterfall, upstream from a namesake neo-gothic manor and a renovated hydroelectric power plant built in 1928.